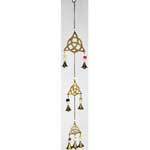 Dangling upon a beaded chain, this musical chime displays three graceful triquetras that sway with the slightest breeze to set its small chiming bells to ringing. 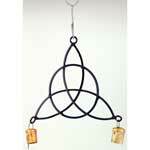 This simple wind chime has been crafted of wrought iron to create the image of a triquetra, with two copper bells dangling from its bottom points. 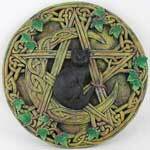 Blending marvelous details with vines and Celtic knot work entangled around a Crescent Moon and a pentagram, within the center of which rests a black cat. 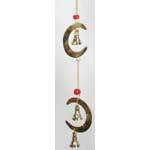 It measures 7 1/2" in diameter. 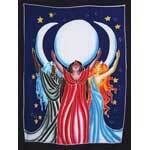 Celebrate the ancient trinity of femininity with this banner, which boldly displays the maiden, mother, and crone symbolically beneath a triple moon. 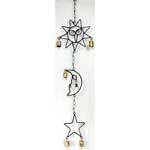 Crafted of wrought iron, this wind chime links together three icon images of a sun, a moon, and a star. 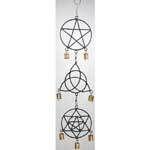 Each features two copper bells that ring with a light, jingling music. 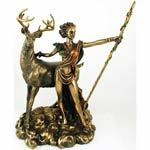 This lovely statue portrays Diana, the Roman goddess of the moon and the hunt. A goddess of light and virginal purity, she was a protector of women and a goddess of the woods. The entire statue measures 10 1/4" high and 6" wide. This statue takes the form of the Goddess of Elemental Fire, clad in the flames that she represents, she holds blooms of flame up from her hands like torches; a beautiful representation of the elegance of this element. This lovely statue portrays a dark angel, cradled within the black curve of a crescent moon in a manner that speaks powerfully of feminine strength and grace. 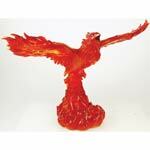 Celebrating the sacred Phoenix, an immortal bird of fire consumed and reborn within its own flame, this statue depicts the magnificent creature in the design of artist Tom Wood. The Greek god of wine and plenty is shown here, raising grapes to his lips in indulgence and dragging a jug of wine behind him, heedless of how it spills. 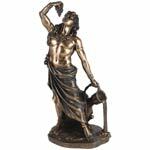 This statue stands approximately 10 3/4"high. Aphrodite, the Greek goddess of love, beauty, and sexuality is presented here as a classical statue, sculpted of cold cast resin and styled so as to appear to be bronze. 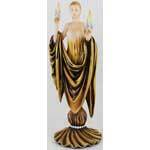 The statue measures approximately 11 1/2" in height. This unique and lovely piece captures the traditional image and placement of the Greenman and brings him into your home as this ornamental door knocker. 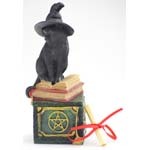 A black cat wearing a conical witches hat sits atop a pile of spell books. The box contains a blank scroll tied with a red ribbon which can be used as part of wishing or petitioning work.